Learn more about the Lorex 4K 8MP HD Camera Home Security System. Get pricing, and answers to common questions. The Lorex 4K 8MP HD Camera Home Security System includes a four-channel 4K HD DVR, and four bullet security cameras with built-in microphones for listen-in audio functionality. 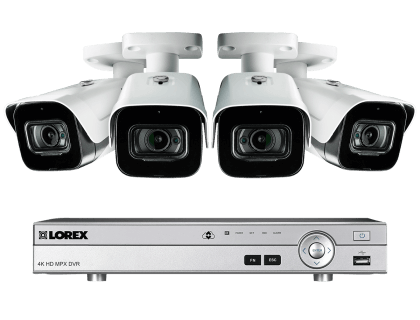 This Lorex business security system's IP67-rated cameras provide excellent image quality. 4K DVR can support up to 4 cameras. 4 Ultra HD 8MP security cameras. Pros: Audio enabled. Can record four times the amount of pixels of a 1080p camera. Cameras have split-glass design to minimize infrared reflection. Cons: Not that easy to set up. Bottomline: Security system to protect your growing business around the clock in all weather. What are some alternatives to the Lorex 4K 8MP HD Camera Home Security System? Where can I buy the Lorex 4K 8MP HD Camera Home Security System? The Lorex 4K 8MP HD Camera Home Security System is available via Amazon and the Lorex website. Does the Lorex 4K 8MP HD Camera Home Security System work at night? Yes. Some external lighting enables this system to utilize its Color Night Vision (CNV) technology, which can see details such as the color of clothes and cars. In the absence of external lighting, the cameras will switch to infrared (IR) black-and-white night vision. This system has a night vision range of up to 150 ft. in ambient nighttime conditions, and up to 100 ft. in total darkness. Can the Lorex 4K 8MP HD Camera Home Security System be used in any weather? Yes. The Lorex 4K 8MP HD Camera Home Security System has weatherproof cameras. These IP67-rated cameras have the highest waterproof rating available for Lorex security cameras, and can endure all weather and function in temperatures ranging from -22 °F to 140 °F.